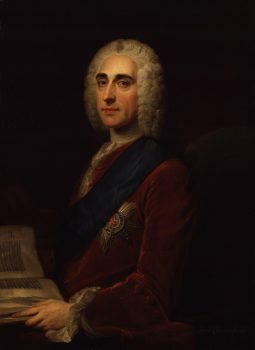 It was Lord Chesterfield, not a particularly profound thinker, who in 18th-century England correctly observed that “I am very sure that any man of common understanding may, by culture, care, attention, and labor, make himself whatever he pleases, except a great poet.” Given that Chesterfield was an aristocrat, and with all that sense of self-importance and entitlement that such aristocrats in those days (and since) bestowed upon themselves, and also well-known as a man of letters, this was quite a severe constriction or limitation that he placed upon all peoples everywhere: You simply couldn’t make yourself a poet no matter what you did! And as un-egalitarian as it sounds and is, it points to the real difficulty there is in becoming a poet (and by, I think, legitimate extension, an artist of any sort: composer, artist, or dramatist, to name three other major and cognate disciplines). Schools, colleges, and universities will certainly not be quoting this much these days, as for the last 70 years more or less, with the rise of modernism and post-modernism, anybody can be a poet; anybody, everybody is a poet. Just express yourself, and let’s not be judgmental about these scribblings, howsoever feeble they may be. Further, if we abandon form—free verse or vers libre—then nobody will be able anyway to judge the merits of what you do. Voila! Problem solved; no standards of judgement at all. We can all write poetry. Everybody gets a prize. At least so it seems if some of us were not able to penetrate the lies and delusions that Western society foists on us in the name of great education. And not just education. This all ties in with the personal development movement, one of whose great apostles, the American Napoleon Hill, summed it up this way: If you can believe it, you can achieve it. Whatever we want, so goes the dream, if we want it badly enough, we can achieve it. Just believe. Yet, as with being a poet, we find in reality that there are limits to human abilities and achievements; but in hubris, the modern world now takes the populist view that any such limits are defeatist and that, via technology, utopia is just around the corner. Specifically, as to poetry, artificial intelligence will write better poems than humans! I am not sure which is sadder: the idea that any sane person could think so, or that they are attempting—futilely—to do so. Would that all the Lord’s people were prophets, said Moses, so that the Lord would put his Spirit upon them. Would, indeed, that they all were poets, for then our society would be very different. But they are not, and we have to ask why not, or even: So how does one become a poet, then, if no amount of common understanding, culture, care, attention, and labor will make one so? How Is a Poem Made? 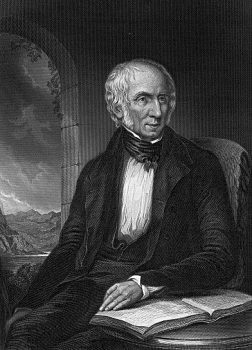 Wordsworth described the origins of poetry as being “emotion recollected in tranquility,” which is true, but a pretty remote way of expressing it. It really doesn’t give us enough to go on. It invites mellow bores to sit around viewing the landscape in reveries, while making jottings about how they feel, and then with a little shaping, find they are writing poems. But the Greeks had much more dynamic ideas, and in their myths, sometimes in the small wrinkles, the tiny details, we find the clues as to the real origins of poetry. Of course, it is a given that the myths are telling us about our own psychology, so the small particulars are bound to be meaningful. 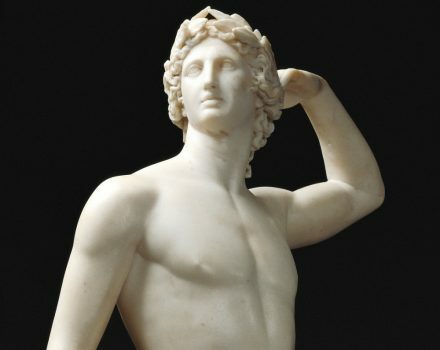 Here is a really interesting conundrum that few have commented on: The god Apollo is indisputably the Greek god of poetry. He is also the god of light, the sun, and the god of healing and prophecy. He is also the father of the nine Muses of poetry, and the father or grandfather, of Orpheus, the greatest poet who ever lived. But the point is that Apollo personifies the values of order, harmony, reason, and moderation; yet poetry, however disciplined it may be in itself, has always been associated with emotion, extremes, and illogicality. As Shakespeare’s Theseus observed (and what bigger authority could we have? ): “The lunatic, the lover and the poet/Are of imagination all compact.” How can the god of poetry be the god of reason and light? 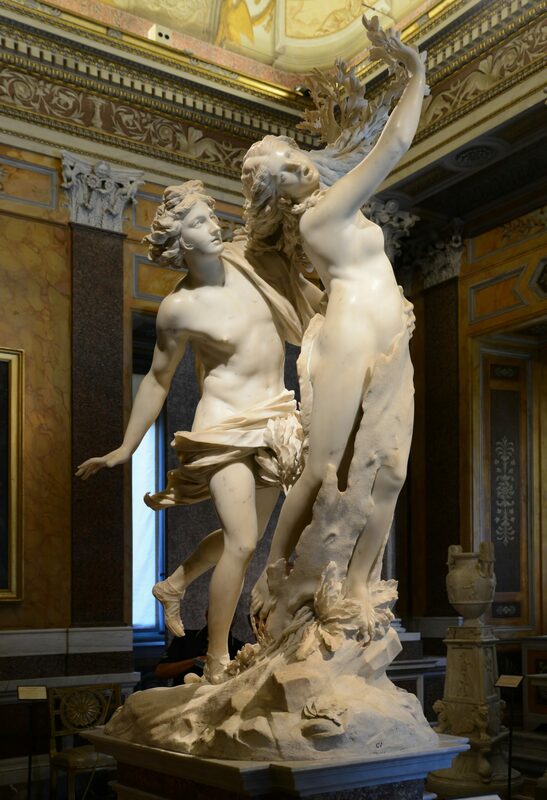 The key myth that enables us to understand this process is that of Apollo and Daphne, perhaps most famously told in Ovid’s “Metamorphoses,” or “changes.” To show the superiority of Eros’s arrows of love over Apollo’s arrows of destruction, the god Eros struck Apollo with unquenchable desire and love for the river nymph Daphne. She was the daughter of the river god, Peneus. So, the god of reason pursues—as a greyhound does a hare—the beautiful Daphne who is committed to remaining a virgin. Thus, the love which is also an all-consuming sexual desire, closes in on the object of its desire, for how can a mere nymph outrun the god of light? 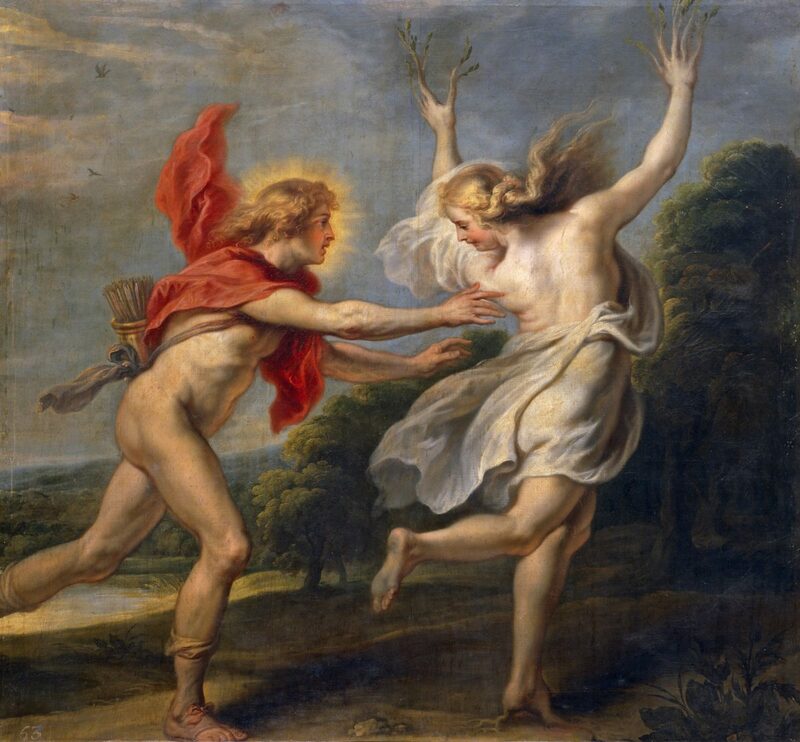 Then, brilliantly, at that point where Apollo reaches out to touch Daphne, she prays to her father to transform her and protect her from this consummation. Now, keep in mind, Peneus is a river god, a god of water, and water always symbolizes emotions, for it is always shapeless and flowing; and at that point, suddenly, she stops moving—a moment of tranquility—and becomes another living thing, rooted in the ground, a laurel tree. For what has happened here? The poem has been written. It starts in the armory of the god of love, which strikes the god of light and form and purpose with desire for the pursuit of beauty. In other words, love creates, and the creation becomes visible because light illuminates it. In fact, the light pursues the form of beauty in order to fully possess it, to consummate, as it were, the oneness of the lover with the beloved. Notice how this “striking” by love is, metaphorically, generative and creative, and it accelerates toward the object of its desire. Think of the poet—the maker, or any creator—reaching out with love for their own creation. There is in this an ecstasy that creation is reaching for. But here’s the thing: At the point of the creative light reaching to touch the beauty, at that precise moment, that moment of stasis, of Wordsworth’s tranquility, the ecstatic epiphany occurs because the beauty prays the holy prayer (hence why poets invoke the Muse) to its emotional sources, as emotion is always associated with water. And the river god answers with all the power of the river’s emotional intensity. Light and form fuse with emotion into the living thing we call a tree, or a real poem. That is the point, the point of creating. And in explaining the myth, we can see that although Wordsworth is right about “emotion recollected in tranquility,” this is really far too passive a way of understanding how poetry is written. No wonder not just anybody can be a poet. For to be a poet, one has to live with a profound uncertainty, or what Keats called “negative capability”: The prayer being answered—that holy moment—cannot be summoned by human will. As the ancients recognized, poetry is not a rational act of the will, or just a skill set. Skill sets are for versifiers. 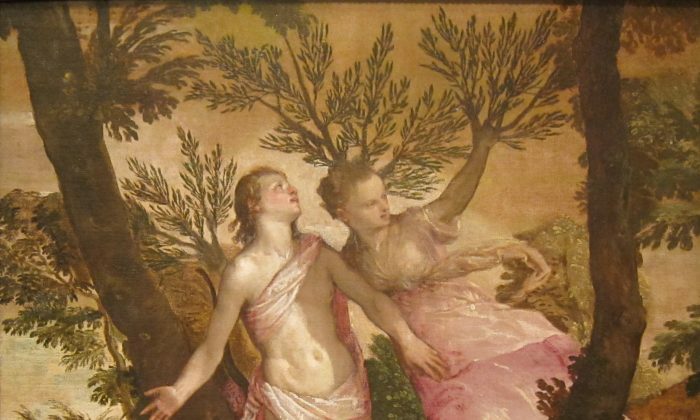 Daphne escaped Apollo and became a laurel tree. 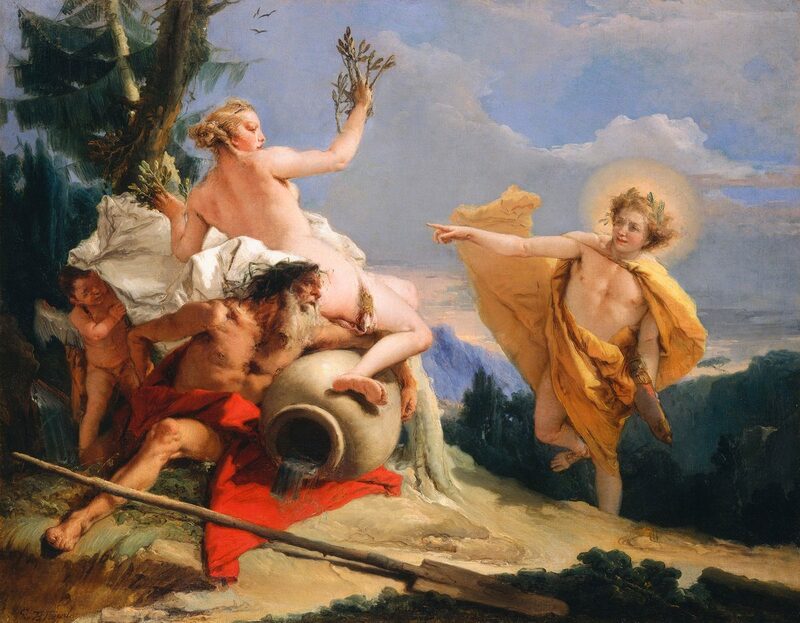 Apollo, then, embraced the tree, arms around it, and swore undying praise to it. Laurel, the Latin “laudis,” means praise, and leading poets are called Poet Laureates. Such is the instruction Apollo has given us. The leaves of the laurel tree forever after symbolize the true poet, and true poets wear the laurel wreath—the crown on their heads through which divine inspiration strikes them. That is the process, but try teaching that in schools today! This is why, in a weird sort of way, most professors of literature in our universities cannot possibly be poets. How could they be? They’re academics, salaried, safe types. 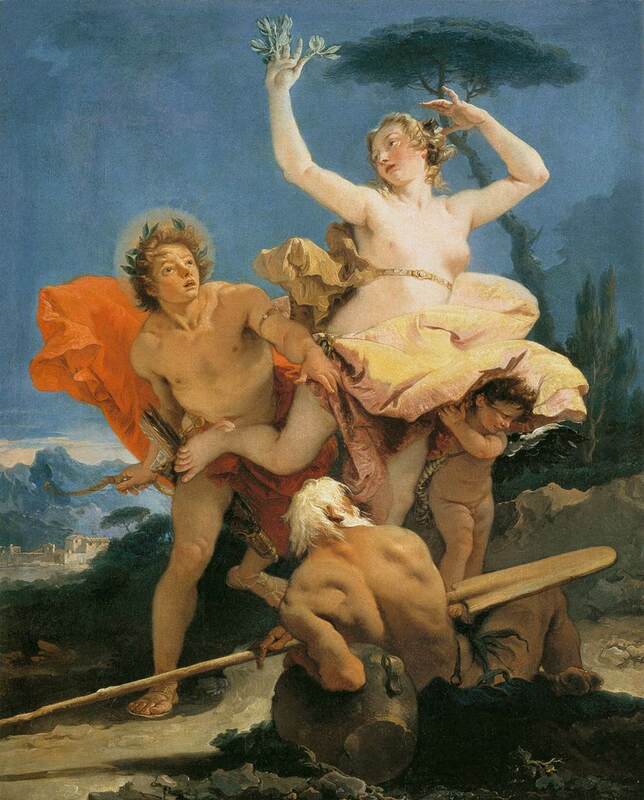 There’s nothing safe about Apollo’s pursuit of Daphne; it’s not about a Ph.D., and (to be fair) even less about ignorance (as if “not knowing” about poetry could help one be a poet). Yeats is the major poet of the last 100 years who completely “got,” and lived, this kind of mythology. Finally, we know that probably over 95 percent of the “famous” poets today in the United States and the UK who are published by the major publishers and reviewed in the major papers are not poets at all. And we know this of course because, unlike, say, Robert Frost, nobody reads or buys them anymore, apart from small coteries of idolizing followers. These “poets” are ideologues, most of them. They want to take a stand for or against “equality,” feminism, anti-racism, gender diversity, political oppression, Marxism, the Catholic Church, pedophilia, or some such issue. They are not pursuing the beauty of Daphne with generative love. Instead, their brains express some logical proposition about some ideology; the language is lineated (so it’s poetry, yes? ), largely formless, and it may be abstruse, abstract, extreme, pointed, funny even, but it is never beautiful and never comes from the soul where the true river of emotion flows. In short, it is entirely a mental construct, like a shopping list, but one that ticks the virtue-signaling boxes and plays to the public gallery of simplistic ideas. No one in 50 years’ time will be reading them. But we will still be reading Emily Dickinson, Robert Frost, and W.B. Yeats—the real poets, inflicted with the strange desire of Apollo for the unattainable beauty that is beyond the reach of men and women. In this series, Myths: Mapping Our Way Home, James Sale revisits why myths—all but discounted today—remain crucial to understanding our place in the universe, if not to our very survival.